Kuber is the God of wealth and the treasure. Worshiping Kuber Kunji brings prosperity and luck. Kuber Kunjee may be kept in home temple, cash box, almirah and in office where financial transactions take place. It is believed to be miraculous for those who are facing financial troubles in their lives. 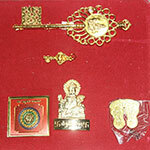 This wonderful talisman facilitates promotion and increments, monetary benefits, and gain in business. Kuber Kunji is the key to attract wealth and success in your life.